"There's a fear. It's there. It'll always be there..."
Bullets from Bear Arms Firing Range are Allegedly Encroaching Into a Residential Area and Homeowners are Ready to Fight for Their Own Safety. 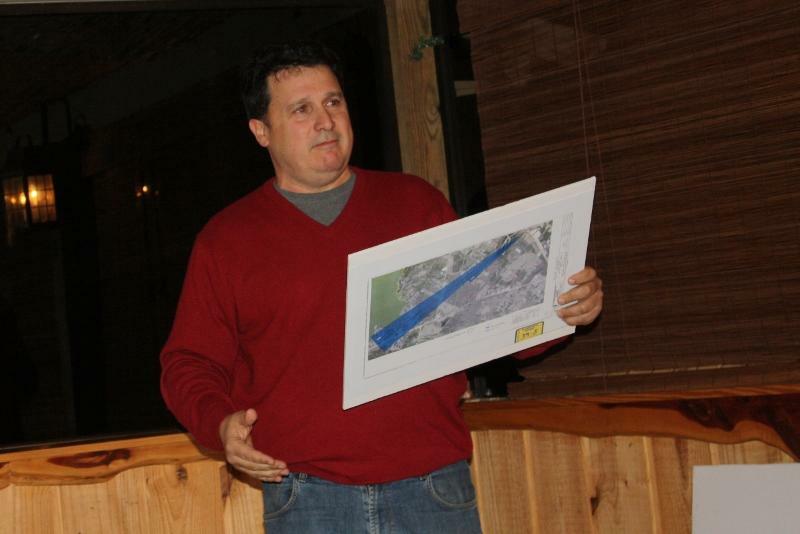 Frank Nuchereno, Vice President of Anthony Properties speaks to property owners from the Four Corners subdivision in a conference room at Buster McNutty's on December 28th, 2011. Property Owners from Local Subdivision Not Giving Up in Their Fight for Their Own Safety, LIVINGSTON, December 29, 2011 - Property owners that are fed up with being afraid to walk in their own yards met at Buster McNutty's on the evening of Wednesday, December 28th, 2011 to regroup after losing a jury trial against Bear Arms (local gun dealer and gun range). The controversy swirls around a segment of the Four Corners Subdivision located off US-190 West a few miles west of Livingston. The properties in that segment of Four Corners allegedly lies directly in the path of the Bear Arms rifle range. The range is allegedly not built well enough to adequately contain the projectiles that are being fired from it's shooting stalls. "It's about our safety" said one mother who was in attendance at the meeting. 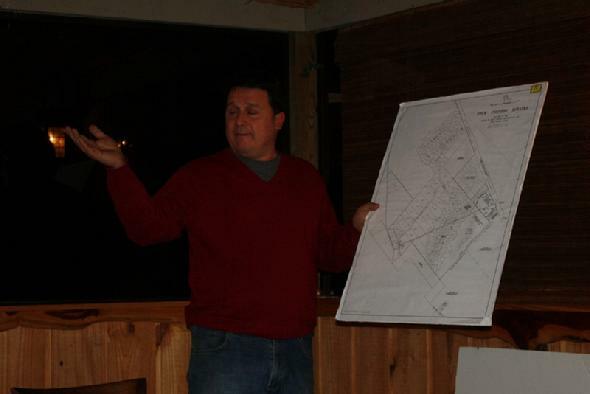 The meeting was headed up by Vice President of Anthony Properties Development, Frank Nuchereno. Nuchereno came ready to speak and with media in attendance spoke for over an hour to property owners telling them that we're not giving up the fight. Nuchereno held up maps showing the two establishments (Four Corners and Bear Arms) and how part of the subdivision was directly in the path of the range. Anthony Properties hired an independent neutral surveyor. The surveyor showed that there was in fact a direct path from the shooting stalls to the peoples' homes. Nuchereno stated that "The State of Texas doesn't want anything to with certifying if some gun range is built safely". Nuchereno then stated that he contacted the NRA who provided Nuchereno with a manual written by an NRA Engineer. According to the manual provided by the NRA, the Bear Arms rifle range is nowhere near the design and safety specs laid out by the NRA on what a safe gun range is. Nuchereno personally contacted the NRA Engineer who visited locally and testified in court on the matter. According to the Engineer, if a rifle barrel is raised up one inch from its intended target, it will miss the berm and the trees behind the berm. Beyond those trees lies homes from the Four Corners Subdivision. A retired Texas Ranger who has run other gun ranges and teaches at San Angelo State stated that in his opinion, the Bear Arms gun range was dangerous, and that sooner or later someone who's on the other side of those trees was going to get hurt. According to the NRA, a segment of Four Corners subdivision is an area of high danger and has a high probability of incoming bullets. Nuchereno spoke of countless bullets that missed the berm and were lodged into trees behind the berm. During the trial, one tree was brought in to the courtroom and bullets were dug out the tree right in the courtroom. "We don't want the gun range shut down, we just don't want the bullets flying into our back yards" Nuchereno said. According to Nuchereno, the NRA said that the chances are small, but the consequences are tragic. Even if it's a 1 in 1,000 chance, as more shots are fired, eventually a bullet will hit the wrong item. It wont be a carport, it will be a child or an adult. "One person who's in this room tonight was clearing his property and his tractor was pinged by a bullet", Nuchereno said. He continued "A man who was plumbing had a bullet land next to him who said it came from the range". Nuchereno further stated that a man and his daughter who were in a deer stand behind the property were pelted with bullets when the gun range was open. His daughter balled up and tried to crawl to safety. The angry man (a local business owner), drove straight to Bear Arms and wanted to beat the hell out of Mr. Phillips, but Sheriff's Deputies stopped him. Nuchereno was almost beside himself as he spoke to the property owners about how a jury from Polk County could possibly rule in Bear Arms' favor in light of the evidence that was put before them. "Judge Trapp has the right to say, 'You know, this is so outrageous that I want to have a new trial, we have a bad jury'". Nuchereno continued, "This is a marathon" he said, "...The first trial was a sprint. We're not going anywhere. Anybody who lives out here cannot accept the fact that they cannot enjoy their property or have their children or grandchildren playing in their own yard". Nuchereno went on to say that if a new trial is not called for, then an appeal to the original trial will be in order. If you live in the blue area, you're in danger: Nuchereno holds up a map showing a direct path from the firing stalls at the Bear Arms rifle range to the subdivision of Four Corners where houses and families are located. According to Nuchereno, this is a marathon and the first trial was just a sprint. "We're not going anywhere" he said.